Es un complejo de edificios residenciales conocidos como Palacio de las Acanaladuras el cual debe su nombre a la decoración en forma de paneles con acanaladuras verticales que tiene en los muros que rodean el patio interior. El ingreso a este palacio se realiza por la fachada Norte y forma un angosto pasaje o túnel que se ubica en el extremo Este y permite el ingreso directamente al patio central. Is a complex of residential buildings known as the "Acanaladuras" Palace, which owes it name to the decor in the form of panels having vertical grooves in the walls surrounding the courtyard. The entrance to the palace is through the north facade and forms a narrow passage or tunnel that is located on the east end and allows direct entry to the central courtyard. Erected by Palacio Nacional Tikal. Location. 17° 13.168′ N, 89° 37.189′ W. Marker is in Flores, Petén, in Municipality of Flores. Touch for map. Marker is in this post office area: Flores, Petén 17001, Guatemala. Touch for directions. Este grupo forma uno de los mayores conjuntos de construcciones tipo palacio conocidos en Tikal. Parte de este complejo fue investigado y restaurado en la década de los 70´s. Una estructura del Clásico Tardío, Posee un pasadizo abovedado que conduce al patio interior del palacio de dos niveles: Las fachadas de este palacio fueron decoradas con elementos verticales, de donde proviene el nombre de Acanaladuras. Veinticuatro edificios forman este grupo – Su investigación registró información sobre etapas constructivas anteriores con paredes pintadas y graffitis. English: This group conforms one of the major palace type architectural clusters of Tikal. Part of this complex, conformed by twenty four buildings, was investigated and restored in the 70’s. As a palace of the Late Classic period, it has an aisle vault which leads to an inner court at the palace of two floors. 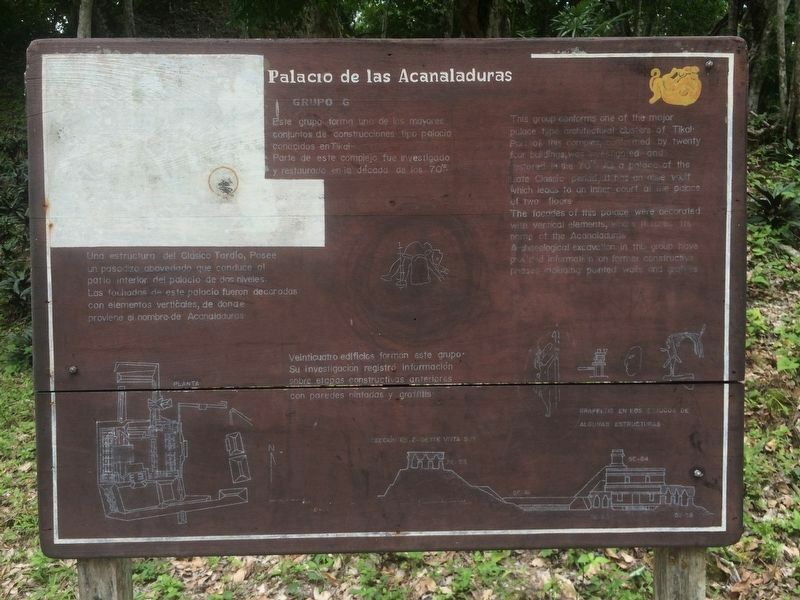 The facades of this palace were decorated with vertical elements, where it takes its name of the Acanaladuras. Archaeological excavation in this group have provided information on former constructive phases including painted walls and grafittis. marker. Temple V at Tikal (approx. 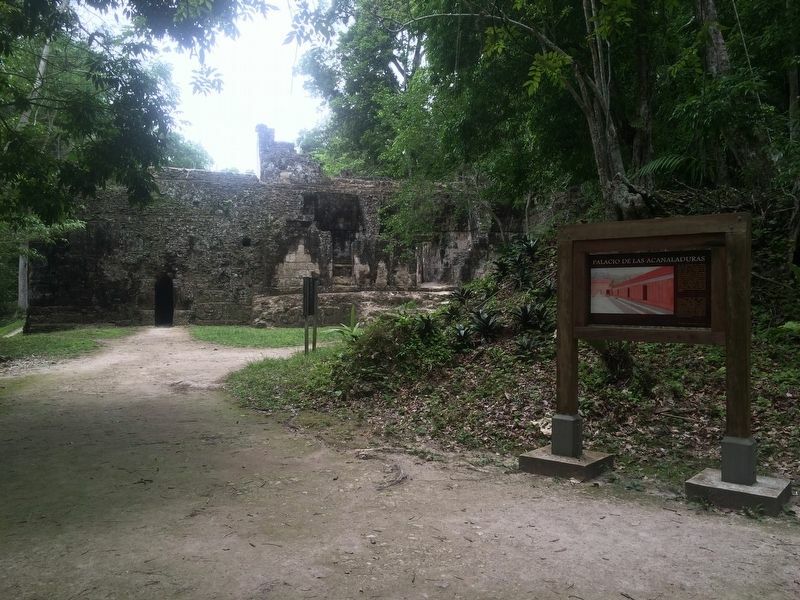 0.4 kilometers away); East Plaza at Tikal (approx. 0.4 kilometers away); Temple II (approx. 0.6 kilometers away); Temple III at Tikal National Park (approx. 0.7 kilometers away); Great Pyramid (approx. 0.8 kilometers away); Sloping Panel Temple at Tikal National Park (approx. 0.9 kilometers away); The Bat Palace (approx. 0.9 kilometers away); Tikal Archaeological Park (approx. 0.9 kilometers away). Touch for a list and map of all markers in Flores. More. 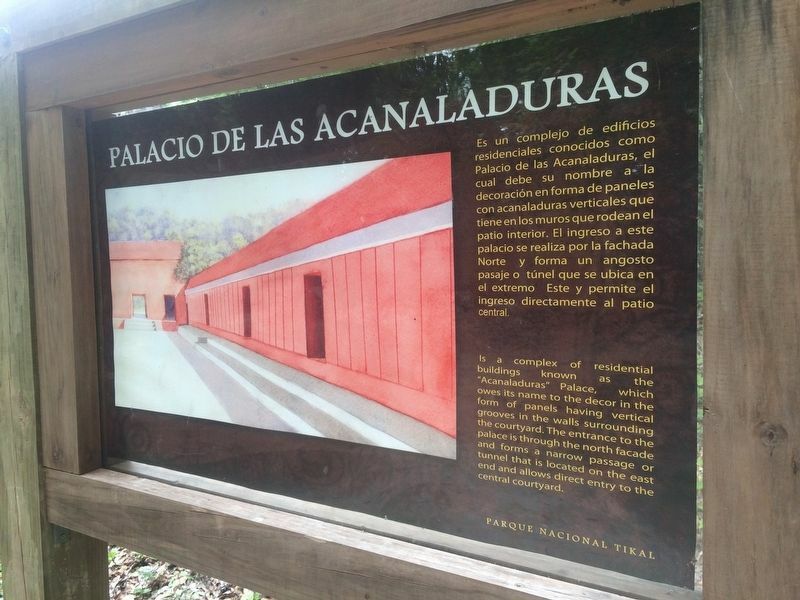 Search the internet for The "Acanaladuras" Palace. Credits. This page was last revised on March 2, 2018. This page originally submitted on October 24, 2016, by J. Makali Bruton of Querétaro, Mexico. This page has been viewed 148 times since then and 6 times this year. Photos: 1, 2, 3. submitted on October 24, 2016, by J. Makali Bruton of Querétaro, Mexico.